At last, we reach the end. 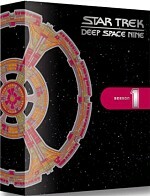 The third Star Trek series comes to a close with Season Seven of Deep Space Nine. I’ll offer valedictory thoughts at the conclusion of my review. Let’s hop into the year’s 25 episodes right away and see how the series finishes. These shows will be discussed in the order broadcast, which is also the way in which they appear on the DVDs. 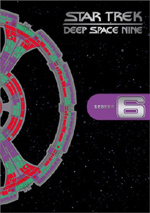 Picking up where the last episode of Season Six, ended, Image In the Sand starts three months after that show’s conclusion and finds newly-promoted Colonel Kira Nerys (Nana Visitor) in charge of DS9 with Captain Ben Sisko (Avery Brooks) still away on indefinite leave. Back on Earth at his dad’s (Brock Peters) restaurant, Sisko eventually gets an apparent message from the Bajoran Prophets: he sees a vision of a woman and decides to find her. It turns out Sisko’s dad knew her and doesn’t want to discuss the issue. At DS9, Starfleet decides to allow the Romulans a presence on the station, against Kira’s wishes; however, she comes to respect the main officer in charge of their group. We also see that the war has somewhat shifted to favor the Dominion as well as Worf’s (Michael Dorn) grief over the loss of Dax. Perhaps they should have called this episode “As the Space Station Turns”, for “Sand” offers some serious soap opera elements. The Sisko line provides an out of nowhere revelation that would fit in neatly with daytime TV. The show produces some plot points that set up matters for the future, but on its own, it feels more like a teaser than a full program. A new Dax appears via Shadows and Symbols with jittery young Ensign Ezri Dax (Nicole deBoer). She meets Sisko at his dad’s restaurant and goes off with them on an adventure to find out more about an item encountered in the prior episode. In the meantime, Worf and many others head off on a dangerous mission partly meant to ensure that Jadzia gets to Klingon heaven. Back on DS9, Kira institutes a standoff with the Romulans when they allegedly want to put weapons on a site loaned to them by the Bajorans. My friend Kevin warned me that Ezri Dax was annoying, and he wasn’t kidding. Granted, it must have been tough for them to come up with another young female character who didn’t just duplicate Jadzia, but surely they could have done better than this skittish annoyance. Maybe she’ll become more likable as things progress, but with only 20-something shows to go, I won’t count on it. As for the rest of the show, it works acceptably well. The Sisko subplot takes an unexpected and clever turn that hearkens back to an episode from Season Six, while the standoff on Bajor creates some tension. Only the Worf domain fails to become compelling. Overall, the show seems erratic but it keeps matters moving nicely. As Ezri adapts to her new self and the folks on DS9, Afterimage shows her at work as a counselor. Garak (Andrew J. Robinson) starts to experience severe claustrophobia, and that interferes with his ability to decode Cardassian messages for the Federation. In addition, Quark (Armin Shimerman) challenges Dr. Bashir (Alexander Siddig) to try to win over the heart of Ezri, a fact that enrages Worf. While we get to know Ezri better here, this doesn’t make us like her much more. “Afterimage” feels like a contrived attempt to develop her role to the exclusion of most else, so it doesn’t do much for me. Sisko reencounters an old Starfleet acquaintance of his when Vulcan Captain Solok arrives at DS9. His ship needs repair, and in the meantime, he challenges Sisko and crew to a game of baseball in Take Me Out to the Holosuite. The obvious tension between the two means that Sisko wants to trounce the Vulcan crew, he presses his gang to learn the game in a hurry. “Holosuite” presents a DS9 take on The Bad News Bears. The show does nothing particularly special, but it pulls off a reasonably amusing look at their travails. Bashir’s fellow genetically enhanced buds from Season Six return in Chrysalis. They want Julian to do some surgery to restore Sarina from her fairly catatonic state, and he agrees. This succeeds, and romance soon blooms between the doctor and the babe-a-licious Sarina. Inevitably, some complications ensue. The other genetically enhanced characters offered a clever and interesting program last year, but it seemed a little too soon for them to return. Granted, with so few shows left in the series, I guess they didn’t have much choice, but their entertaining impact diminished due to the rapidity of their resurrection. It doesn’t help that the episode’s early shots of a lonely Julian telegraph where the plot will go and we also know something will go wrong along the way. “Chrysalis” offers a mediocre episode. After years as the main Vorta representative who faced off against our heroes, Weyoun (Jeffrey Combs) tells Odo (Rene Auberjonois) he wants to leave the cause in Treachery, Faith, and the Green River. Matters complicate when we find out that Weyoun is the sixth in a line of clones. Normally a new replication appears only after the demise of his predecessor, but with Weyoun 6’s defection, Weyoun 7 comes on the scene to try to stop him. Weyoun 7 and Cardassian leader Damar (Casey Biggs) plan to shoot down the runabout with Odo and Weyoun 6 before they can return. In the meantime, Ensign Nog (Aron Eisenberg) irritates Chief O’Brien (Colm Meaney) as he uses his Ferengi talents to weave a web of trade and achieve some difficult goals. “River” balances the two plots well and allows them both to prosper. The main theme with Weyoun suffers from a somewhat less than great conclusion, but it presents a very intriguing take on the subject and also allows for some important story points to emerge. The bit with Nog and O’Brien provides some clever and funny elements that lack the precious tone that affects much Trek humor. Overall, this is a strong episode. Aging Klingon hero Kor (Jon Calicos) approaches Worf for help in Once More Unto the Breach. He can’t get active work and wants to go back into battle. However, General Martok (JG Hertzler) refuses since he maintains negative feelings about Kor. Worf manages to get him to relent, and Kor signs onto Martok’s ship as third officer. Despite his current lack of success, Kor maintains a strong reputation as a Dahar master, so when the crew genuflect to Kor, Martok becomes irritated. Problems emerge as we detect mental problems displayed by Kor. After more than 170 episodes of Worf on Next Generation and nearly 100 of DS9, I must admit I’ve just about had my fill of him and the intricacies of Klingon culture. No other Trek character has been in as many shows, and given the fairly one-dimensional nature of the Klingons, these stories got old a while back. “Breach” brings nothing new to the table and feels fairly predictable and lackluster. When Sisko and crew take the Defiant to deliver supplies to an outpost on the front lines, they find stressed troop[s who’ve been stuck on the hotly-contested rock for longer than normal. They feel abandoned by Starfleet, so when the Jem’Hadar launch The Siege of AR-558, Sisko decides to keep his personnel on the planet and help them fight. Trek series rarely depict Starfleet personnel who behave in a less than exemplary manner, so I usually enjoy the episodes that show a more human side to them. One interesting complication comes from the presence of Quark on the trip; ordered by the Grand Nagus to collect information, he attempts to influence his nephew Nog’s behavior. All of this adds up to a surprisingly rich and deep episode. When she visits with a Bajoran religious leader, Kira gets beamed to Empok Nor in Covenant. There she meets with Gul Dukat and his clan who believe in the nasty Pah-wraiths, the enemies of the Bajoran prophets. He tries to convince her of his mission. Although I normally don’t like the episodes that focus on Kira and the Bajoran beliefs, “Covenant” proves surprisingly good. It keeps us off-guard as it explores its subject, and it never spells things out for the viewer in a blatant way. It helps further the series’ overall story line and provides a satisfying show. After he lost his leg during the AR-558 attack, Nog returns with his artificial limb in It’s Only a Paper Moon. However, this reunion fails to offer much joy, as a badly depressed Nog sleeps all the time and refuses to listen to anything other than one song. No one can get through to him, and he visits the Vic Fontaine (James Darren) holoprogram, where he takes refuge in the same old song. Eventually Nog decides to live with Vic – the self-aware hologram - in the holosuite, where he attempts to come out of his funk. “Moon” enjoys an interesting theme, as we rarely see the aftereffects on battle on crew. That would offer an intriguing episode if “Moon” didn’t go for such a gimmicky take. I disliked the Fontaine character the first time he appeared, and I’ve not warmed up to him since then. “Moon” suffers from silly execution. O’Brien still wants to make amends for the death of Bilby in Season Six’s “Honor Among Thieves”. He goes AWOL on New Sydney in an attempt to work things out with Bilby’s widow. Ezri’s family are powerful members of that society, so Sisko orders the Prodigal Daughter to head home and find him. She then has to deal with her estranged family. The more I see of Ezri, the more I think my friend Kevin’s right. She does present an annoying character, and an entire episode focused on her and her family doesn’t help make her any more compelling. “Prodigal” feels like little more than cheesy soap opera, and the O’Brien subplot doesn’t help it. Grand Nagus Zek (Wallace Shawn) goes missing in The Emperor’s New Cloak. The alternate universe’s Ezri – a much tougher customer than the whiny counselor – shows up and tells Quark that if he doesn’t give them a cloaking device, they’ll kill Zek. This leads Quark and Rom to actually enter the alternate universe. “Cloak” feels like little more than an attempt to allow some characters who never appeared in prior alternate universe episodes to get their fill. Those programs were fun for a while, but by now, they’ve gotten old. The only real fun from “Cloak” stems from Rom’s confusion as he tries to figure out if everything in the alternate universe is supposed to be different. After a night of drunken celebration, Field of Fire starts with the murder of Lieutenant Hector Illario (Art Chudabala). Another killing follows, and the episode follows the mystery of who committed the crimes. Unfortunately, this actively involves Ezri, as she becomes haunted by visions of a murderous prior Dax host. I understand the series’ choice to present so many Ezri-centric episodes; she’s a new character and she gave the writers a new slant. Unfortunately, she’s a weak new character, so the programs in which she features prominently suffer accordingly. Director’s note: one Tony Dow helmed “Field”. That’s the same Tony Dow best known as Wally Cleaver. This marks at least the second TV sitcom actor to direct DS9, as Anson “Potsie” Williams took on a few episodes. In Chimera Odo meets another changeling who knows nothing of the Dominion. Laas and Odo get to know each other, and it turns out the newbie doesn’t much care for humanoids. After the pair link, Odo learns some truths about himself that he doesn’t seem to like, and Laas also tempts him to leave DS9 and start a newly changeling-oriented life. “Chimera” doesn’t go down as a great episode, but it offers some intriguing elements. Prime among those is the Laas character, as he offers a non-Founder changeling like Odo, but with a different viewpoint. “Chimera” manages to expand Odo’s character nicely as it examines his loves and desires. The holosuite acts goofy in Badda-Bing Badda-Bang. When Julian and Miles visit Vic Fontaine, something goes weird when his rival Frankie Eyes appears and threatens him. Oddly, this character doesn’t disappear when the Starfleet personnel try to shut down the program, so the staff need to figure out how to fix the altered holosuite material without harming Vic in the process. When series start to run out of stories, they often introduce gimmicky new characters. On sitcoms, they prefer babies, but I guess Trek shows need something more exotic, which is why DS9 got Vic. He appears way too much during Season Seven, and “Badda-Bang” presents a pretty lame Vic-focused piece. If this is the last one that concentrates on Vic, it’ll be too soon. During Inter Arma Enim Silent Leges, a reflection from Season Six appears when Bashir gets an assignment from the secret intelligence group called Section 31. Leader Sloan (William Sadler) tells him to gather information at a Romulan conference he attends. Complications and plot-thickening ensues. After the silliness of “Badda-Bang”, “Leges” offers a good return to form. It helps further the overall plot in regard to the uneasy alliance between the Federation and th Romulans, and it provides an intriguing and rich story. It proves interesting and entertaining.